LINE-X, a retail automotive aftermarket franchise and provider of high-performance spray-on bedliners, announces it has been named by Graco Inc., a manufacturer of fluid handling equipment, as one of its top 20 distributors for protective coatings and/or foam and polyurea equipment for 2014. The distributors named to Graco’s 2014 list, including LINE-X, were selected based on the total of their equipment purchases from Graco during 2014. For nearly 90 years, Graco Inc. has been a provider of premium pumps and spray equipment for fluid handling in the construction, manufacturing, processing and maintenance industries. Graco works closely with distributors around the world to offer innovative products that set the quality standard for spray finishing, paint circulation, lubrication, sealant and adhesives dispensing, process application, and contractor power equipment. LINE-X continues to provide the marketplace with innovative coatings that tackle tough challenges with creative and unique solutions to customers and are engineered to meet the needs of virtually any industry. With a full time research and development department, LINE-X continuously drives innovation to meet the needs of everyday consumers and industries, such as trucking and railways, manufacturing, marine applications, defense industry, blast and force mitigation, petroleum and chemical, water waste treatment, and more. 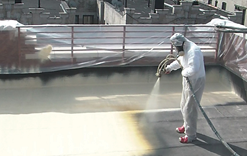 LINE-X protective coatings are designed to absorb impact, resist damage, and meet environmental and compliance requirements and have demonstrated these capabilities in projects, such as fire and SWAT trucks, police shields and ballistics plates, amusement park water slides, heavy machinery, and food processing facilities. LINE-X Protective Coatings is committed to the industries that utilize spray-on applications and expanding to additional locations across North America.